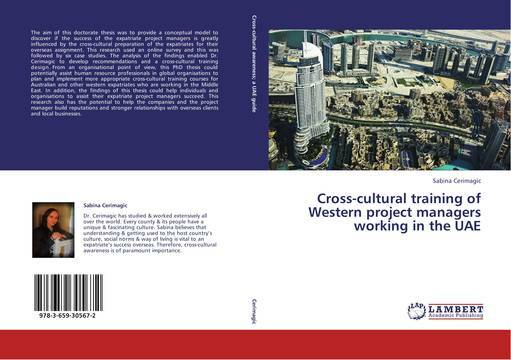 The aim of this doctorate thesis was to provide a conceptual model to discover if the success of the expatriate project managers is greatly influenced by the cross-cultural preparation of the expatriates for their overseas assignment. This research used an online survey and this was followed by six case studies. The analysis of the findings enabled Dr. Cerimagic to develop recommendations and a cross-cultural training design. From an organisational point of view, this PhD thesis could potentially assist human resource professionals in global organisations to plan and implement more appropriate cross-cultural training courses for Australian and other western expatriates who are working in the Middle East. In addition, the findings of this thesis could help individuals and organisations to assist their expatriate project managers succeed. This research also has the potential to help the companies and the project manager build reputations and stronger relationships with overseas clients and local businesses.